How much money will you need in Greece? €108 ($121) is the average daily price for traveling in Greece. The average price of food for one day is €27 ($30). The average price of a hotel for a couple is €109 ($122). Additional pricing is in the table below. These average travel prices have been collected from other travelers to help you plan your own travel budget. How much money do I need for Greece? Greece, located in southern Europe at the tip of the Balkan peninsula, is a country that continues to gain popularity as a top travel destination in Europe. It is at the center of one of the most influential civilizations in history and it's philosophy, art, sports, and language have infiltrated our lives today. From the modern Olympic games, to the words we speak and the politics that dictate our lives, Greece has had an impact on everything we do. 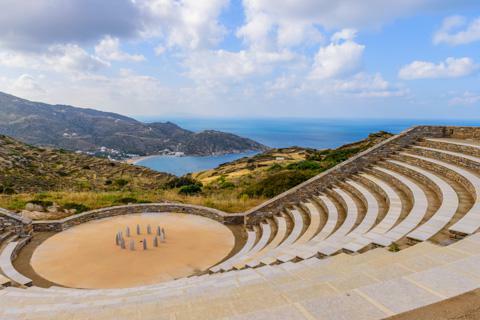 Not only is it of historical significance, but it is also geographically appealing with it's Mediterranean climate, gorgeous beaches, picturesque islands, and mountainous center. This country has something to offer any traveler and its diversity makes it the perfect destination. Travelers arrive here on boat, plane, or by train. The Greek Isles can be navigated by ferry, but many tourists choose to take a cruise through this beautiful area. Athens is probably the country's most chaotic city, but it also offers some of the most impressive glimpses at the area's history, culture, and cuisine. However you choose to visit the area, you're likely to be mesmerized by its beautiful landscape, fresh foods, and strong willed people. Greece was once thought of as a budget travel destination in Europe. This is no longer the case, and you can expect to spend prices comparable to elsewhere in Europe. If you avoid the more touristy destinations, particularly those in the Greek Isles, you will find better deals and be able to keep your travel costs down. Food prices can vary dramatically as well. Head a few blocks away from the central plazas and major tourist crowds. You'll find smaller, locally owned restaurants that have more reasonably priced menus. If you're hoping to buy some souvenirs, go shopping when cruise ships are not in dock. Prices will drop dramatically when it isn't thought that you just arrived on a cruise ship. The cheapest transportation option in this country is usually the bus. Bus routes are generally efficient and frequent. The train may be slower and more expensive, but if you're looking for comfort, this is your better option. Greece is one of the twenty most touristy countries in thew world and is visited by about 17 million people every year, most of whom come from Europe. It's also most visited during the high season which is between April and October. To avoid these crowds consider coming during the winter months when costs are lower and crowds are thinner. When this page was last updated all of Greece's international trains had been suspended due to the country's deteriorating economic situation. Check for updated information on government websites to confirm the situation before you begin your trip. Greece is well connected to its nearby neighbors by a system of ferries. Some of the most popular ports include Venice, Marmaris, Haifa, and Alexandria. This is a fun, but expensive way to explore the region. Compare prices as there are several different companies that run some of the routes. Consider the speed of travel and the class of ticket before making a purchase to make sure you get the most bang for your buck. Many people put a lot of thought into whether they should rent a car. It is advantageous if you're hoping to visit a large number of rural towns that are served by only one or two buses a day. If you are staying in more frequented areas, then a car is more of a disadvantage as it can be expensive, is a hassle, and traffic accidents are not uncommon. Taxis can be difficult to hail, particularly in Athens during rush hour. If you're getting desperate, a good option is to walk to the nearest hotel and have them flag down a taxi for you. This will help ensure you get a driver who is willing to go to your chosen destination. The Temple of Poseidon: Located at Cape Sounion, this temple is dedicated to Poseidon and was built in 444BC. While the temple itself is very impressive, don't skip out on enjoying the amazing views of the city from the top of the hill. Nafplio: A lovely town that, while touristy, has managed to hold on to its charm. It's also conveniently located just a couple hours ride from Athens, making it a nice day or weekend trip. Hydra: Although close to Athens, this island gives you a glimpse into island life in Greece without the challenges of traveling to the Greek Isles. Greek food is the epitome of Mediterranean cuisine. It focuses on fresh fruits and vegetables with lamb or seafood as the main protein items. It's heavily influenced by both Turkey and Italy, but the cuisine is still uniquely authentic. The food you find in Greece is dramatically different than what you might find at most Greek restaurants abroad. In Greece, gyros are little more than a fast food option. Dishes are prepared with care and the ingredients are always of the freshest and highest quality. Meze: This is a traditional Greek dining style that usually includes a series of small dishes that are similar to Spanish tapas. Dishes are served either hot or cold. Popular options include octopus dishes, small salads, cheese plates, or fried sausage. Dishes are usually accompanied by kalamata olives, sliced, hard boiled eggs, or garlic bread. Spanakopita: This is a spinach pie that is made from phyllo pastry and filled with a spinach and feta cheese mixture. The dish is sometimes made with the more affordable ricotta cheese. It can be prepared as either a large dish or small, individual sized pastries. Souvlaki: This is a traditional Greek fast food that is made with meat and vegetables that are grilled on skewers. It is most often made with lamb meat and can be served on skewers, as a pita sandwich, or as the main course of a dinner meal. At dinner it is typically served with potatoes. A more affordable option is to get souvlaki, which is made with pork instead of lamb. One thing many travelers to Greece consider is renting a car. There are several pros and cons to this. If you have your own car you can easily cover more ground and go greater distances at your own pace every day. This helps when you're in rural areas in particular. You can stop wherever you want, when you want, which is very much a nice advantage. Alternatively, there are buses that go almost anywhere in Greece, but if you're hoping to go to smaller towns, they can be quite infrequent. If you're going to a site that very remote, you may also have to walk up to a mile from where the bus drops you off. Alternatively, some people are uncomfortable driving abroad. Greece does have a high accident rate and the roads can be tricky as they weave through the mountains. It's also much more expensive to drive, and gas is quite expensive in Greece. If you're planning to spend any time in large cities like Athens, having a car can be much more of a hassle than it's worth. Also, it's important to remember that having a car may limit the islands you can visit. Typically only the larger islands have vehicle ferries and those can be quite expensive. Consider the type of trip you are planning, places you plan to visit, length of time, and budget before deciding whether renting a car is right for you.